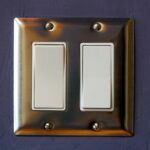 A dimmer switch is great for taking control over the way a room is lit. 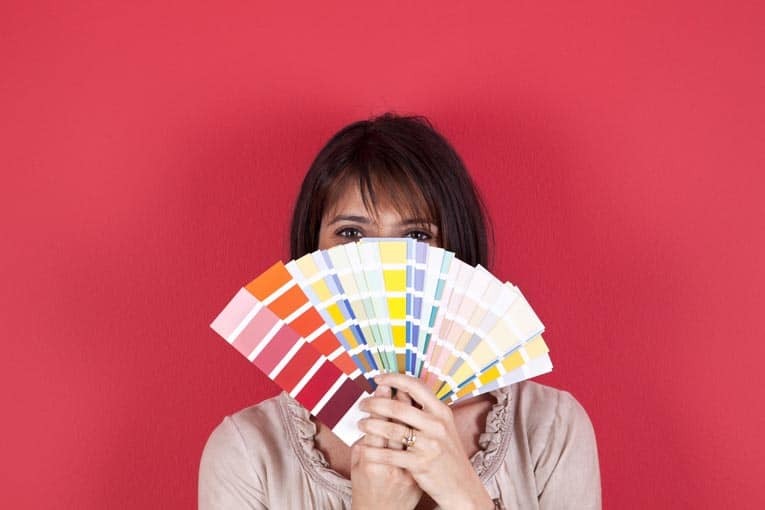 It gives you the ability to make subtle changes in light levels—to set the mood in a dining room, lower the levels in a child’s room, or even give you flexibility with outdoor lighting. Dimmer slowly raises and dims light level to brightness set by small slider. 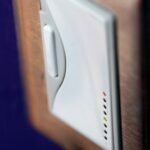 In addition to these aesthetic benefits, a dimmer also has a couple of important, practical pluses. 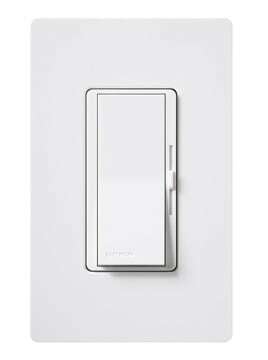 First, a dimmer saves energy by allowing you to tailor electricity usage very precisely, eliminating waste. It also extends the life of most lightbulbs because it minimizes or eliminates the “filament shock” when you flip on a conventional light switch. 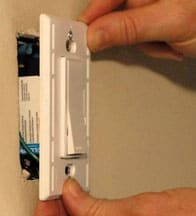 Replacing a conventional light switch with a dimmer switch is a relatively simple task, even if you’re only a moderately experienced do-it-yourselfer. 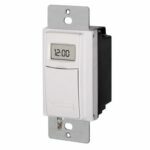 (Note: If you intend to use fluorescent or LED bulbs in the lighting circuit, you will need a dimmer rated for fluorescent or LED.) 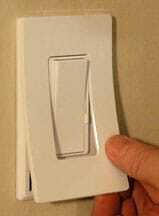 To buy dimmers, see Dimmer Switches. A dimmer switch can cause a lightbulb’s filament to vibrate, creating a buzzing sound when the light is on a less-than-full setting. 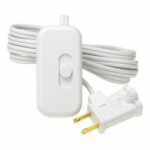 You can buy a new dimmer that’s designed not to buzz and replace the switch, but before you do try replacing the bulb with a “long life” lightbulb that has a sturdier filament and is rated 130 volts instead of the far more common 120 volts. 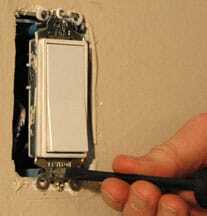 Remove the wall plate and unscrew mounting screws. 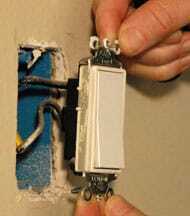 1Use a screwdriver to remove the wall plate. Then unscrew the switch mounting screws. Pull the switch out by it’s flanges. 2Grasp the switch by its flanges and gently pull it straight out of the mounting box. 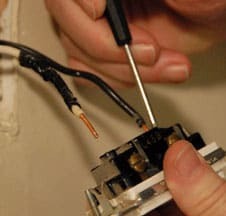 With a non-contact circuit tester, double check to make sure the circuit wires are not electrically charged. Unscrew the wires from the switch terminal. 3Unscrew the wires from the switch terminals. 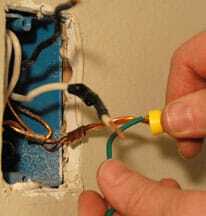 If they are poked into holes in the back of the switch, use a small screwdriver to release them. Straighten the ends of the wires, or, if possible, snip them off and strip the ends again. Connect the switch’s ground wire. 4Use lineman’s pliers to twist the bare end of the green ground wire together with the bare copper ground wire in the box. 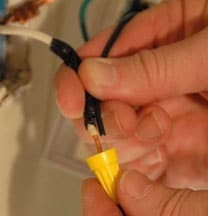 Then use a wire nut to further connect the dimmer’s ground wire to the circuit’s bare copper or green ground wire. Connect the light switch wires. 5Connect one of the dimmer’s black wires to each of the two black wires in the box using wire nuts. Double-check the connections and replace the switch. 6Make sure the connections are tight, and then carefully push the wires into the box, leaving room for the dimmer. Position the dimmer, and screw it to the mounting holes in the box. 7Replace the faceplate. Turn the power back on at the electrical panel, and then try out the switch.